Which Essential Oils Are Safe to Use During Pregnancy? Chamomile tea bags for swollen eyes are a homespun remedy that many people have heard of and perhaps even used. Chamomile, which also goes by the names of Matricaria recutita and Chamaemelum nobile, enjoys a positive reputation among alternative health practitioners and has been used for a variety of noncosmetic purposes. However, existing evidence suggests that chamomile tea bags for your eyes, although soothing, may not have the anti-inflammatory properties that you might think. The Natural Standard reports that chamomile, a daisy-like flower, has been in use for thousands of years for medicinal purposes, such as anxiety, sleep disorders, inflammation of the skin, diaper rash and the healing of skin wounds. 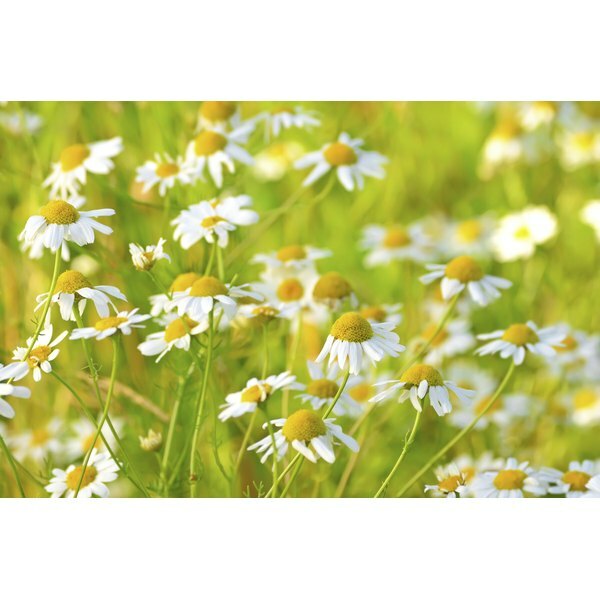 Those in the United States may be most familiar with chamomile as an ingredient in herbal teas. Chamomile tea has a strong, apple-like scent that's not unpleasant, notes integrative physician Dr. Andrew Weil. Chamomile tea bags are commercially available at most large supermarkets, as well as health food markets. Swollen, puffy eyes are common as you age, according to the Mayo Clinic. Fluid can also accumulate under your eyes and cause them to swell. Factors that may contribute to fluid retention include weather/temperature changes, hormonal fluctuations and the consumption of salt. Sleeping flat on your back, without your head raised, can also cause swollen eyes, as can not getting enough rest. Allergies and dermatitis are also a cause of swollen eyelids. Cool compresses are widely recommended for swollen, puffy eyes, as well as the application of cool tea bags. To use chamomile tea bags for swollen eyes, seep two tea bags in steaming water. Let the bags cool completely. Lie down and place the tea bags over your eyes. The benefit of using chamomile tea to reduce eye puffiness is debatable. The National Center for Complimentary and Alternative Medicine points out that although chamomile enjoys a reputation for being a curative for many medical conditions, there's not enough reliable research to support its efficacy for many of them. As an anti-inflammatory, the National Institutes for Health gives chamomile a grade of "C" and goes on to note that existing evidence suggests that chamomile is of little or no benefit as an anti-inflammatory agent. Coming into contact with chamomile can cause an allergic reaction, cautions the National Center for Complimentary and Alternative Medicine. You're more likely to experience an allergic reaction to chamomile if you have an allergy to plants in the same family, such as ragweed, chrysanthemums, daisies and marigolds. If the underlying cause of puffy, baggy eyes is aging, more invasive procedures are required for resolution. Swollen eyes that are persistent, uncomfortable and aesthetically unpleasant can be treated using cosmetic procedures recommended by a doctor, according to the Mayo Clinic. What Are the Health Benefits of Tazo Herbal Infusion Refresh Tea?